MooreReppion.com Blog: I've Written A Book! The Darkness Vs. Eva #1 OUT NOW! 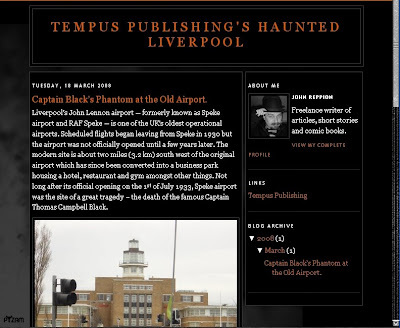 Remember back in September last year when I said I was writing a book called Haunted Liverpool for Tempus Publishing? Well, as of tonight (technically tomorrow morning I suppose), the manuscript and a disk containing all the images are on their way to the publishers. I have finished! Thank you very, very, very much to everyone who has helped me with stories, reference and artwork. Leah has been slaving away checking my spelling, preparing maps and generally slogging her guts out for me these last few days and I'm so grateful for her help; no idea how I'd have done any of it without her. Anyway, I've started a Haunted Liverpool Blog over at www.hauntedliverpool.blogspot.com. It's pretty basic at the moment but I hope to get more stuff like links to the artists involved, etc soon-ish. There's an abridged piece from the book on there as a taster of what's to come. Hope you like it.